Are you ready to be pampered? Then look no further. 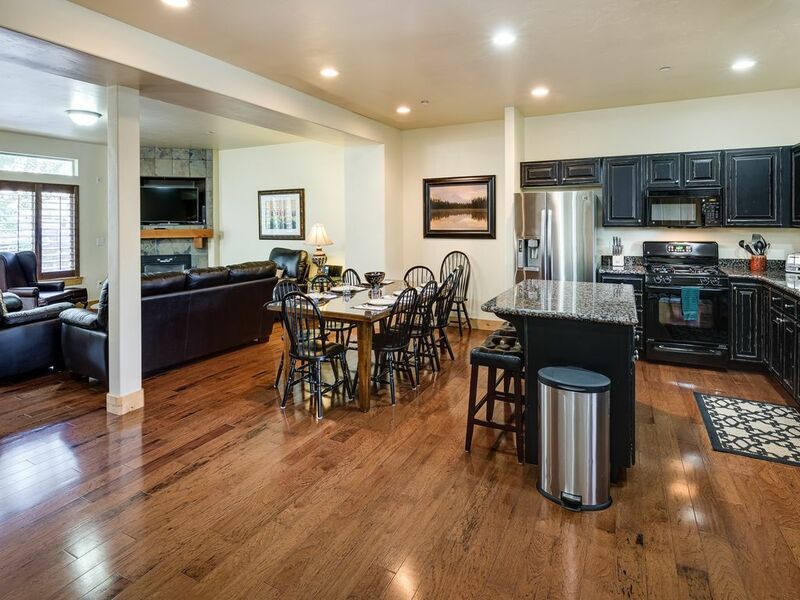 Located in Bear Hollow Village in world famous Park City, Utah, this luxurious and spacious 2,150 square foot townhouse is both beautiful and well-located. We previously had a smaller condo in Bear Hollow, but liked the area so much that we bought a larger townhouse in the same complex. Most of the reviews below refer to the condo which I have been renting to guests since 2008. The townhouse is an end unit in Bear Hollow Village located near the Canyons, Deer Valley and Park City Ski Resorts. Its location gives it a better view than many of the townhouses in the complex. The townhouse is conveniently located near skiing, snowboarding, golfing, shopping, tennis, grocery stores, biking, zip cords and miniature golf. Across the road is Redstone Shopping Center with a movie theater and a wide variety of excellent restaurants and shops, including a Whole Foods Grocery store. At the entrance to Bear Hollow Village is a BUS STOP for easy access to Park City's free bus system. The townhouse also has an enclosed garage to keep the snow off of your car. The townhouse has 4 bedrooms and 3 1/2 bathrooms. It is fully furnished and equipped to make your stay COMFORTABLE and LUXURIOUS. The townhouse is in a great location because it is an end unit and unlike may townhouses in Bear Hollow has views from the deck. The Master bedroom has a QUEEN bed, walk-in closet and a private bathtub and shower. The 2nd bedroom has a QUEEN bed. The 3rd bedroom has 2 twin beds. These 2 bedrooms share a full bathroom. The 4th bedroom downstairs has a QUEEN bed and its own private bathroom. Every bedroom comes with its own flat screen TV. The television is a cable system with over 200 channels, including HBO, and a DVR for the television in the living room. The downstairs bedroom also has an Xbox to keep the kids entertained. The kitchen comes fully equipped, and beautiful, with granite countertops, alder wood cabinets and GE stainless steel appliances. A full-size WASHER and DRYER are located in the townhouse. The townhouse is also equipped with central heating and A/C for the upstairs living area, as well as a gas fireplace. The townhouse's amenities are superb with Sealy posture-pedic pillow top beds, 450 thread count sheets, Turkish spa towels and Dansk plateware. The living room has a leather couch and love seat with large ottomans to stretch out on. No detail has been overlooked to ensure a relaxing and luxurious stay. A short walk away from the townhouse are the swimming pool (summer only) and a large HOT TUB (all year long) for your relaxation after a hard day of skiing, shopping or wherever the day has taken you. However, there is also a private HOT TUB on the townhouse's deck, as well as a gas grill. For your convenience, there is a 3,000 sq. ft. clubhouse with a well-equipped fitness center, free PCs, locker rooms and lounge area ready for your use. For those of you who strive to stay connected, HI SPEED WIRELESS INTERNET is available in the townhouse. For your ENTERTAINMENT, a DVD player, 47-inch FLAT SCREEN TV and SOUND SYSTEM that supports and docks with iPods are in the living room. Although we live in Maui, my family and I love to ski, hike and mountain bike. The natural beauty, wide variety of outdoor activities and proximity to a major airport make Park City a great place to stay. My family and I have been going to Park City for so long, we finally decided to buy a place there. The location of Bear Hollow Village was ideal because of the proximity to all of Park City's ski areas, as well as Salt lake City. In the warmer months, you can access the Park City biking/hiking trail system from our complex. You can ride or walk virtually anywhere in town by just walking out the door. End unit in Bear Hollow with a mountain view. We really enjoyed our stay in this spacious townhouse. We had two families of four with teenage kids and had plenty of room. The owner was very friendly and responsive. We definitely plan on going back at some point. Came here for a girls ski trip and fell in love with this place!! The house was clean and spacious and had everything that we needed. We would definitely come back to stay. Glad you folks enjoyed it. Loved the selfie you sent me. We were forced to reschedule our HomeAway rental two weeks before our stay because another property canceled on us. Steve was incredibly helpful, communicated quickly even though he was out of the country. We enjoyed the location of the home and all the amenities. The kitchen was very well stocked, the hot tub delightful and the furnishings were comfortable. We had an issue with the air conditioning upstairs and Steve found someone to take care of the problem in one day, again even though he was on vacation out of the country. We could not have asked for better care. Thank you, Steve. Thanks for your kind words. I'm glad it worked out for your group. Very nice size town home near ski areas. This was our families 2nd time in Park City and what we loved about staying here is the town home Is very close to the ski areas, restaurants, grocery stores and Starbucks. It is a short distance to the tubing park which the kids loved. The town home owner is very nice and caring. He checked in with me several times to make sure we were satisfied with everything. I would highly recommend staying here and look forward to coming back. Thanks for the nice words and in being a great and helpful guest. Comfortable and modern condo with great hot tub. Very enjoyable stay. Comfortable condo with everything you need. Steve, the owner, suggested we have a vehicle which was great advice. The property is at the lower end of the SLC valley so it's close to great shopping and restaurants but having a car much better than relying on the free buses. Also just a couple of minutes drive to Canyons ski base for hassle free parking and access to full PC ski area. We had a few noisy neighbours with Martin Luther King and Sundance Film Festival but that doesn't detract from the condo which was everything we expected. Glad you enjoyed the condo.